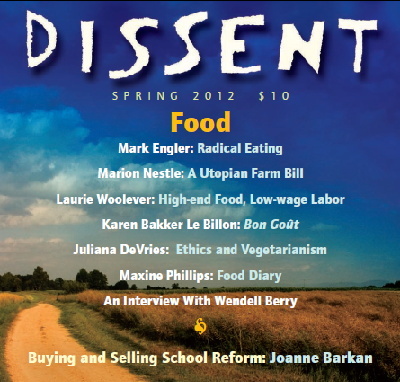 Published in the Spring 2012 issue of Dissent. Organic farming has been hijacked by big business. Local food can have a larger carbon footprint than products shipped in from overseas. Fair trade doesn’t address the real concerns of farmers in the global South. Getting to the bottom of this question and discerning the worth of different food movement offshoots to the radical eater is possible, but it involves some work. It entails grappling with the attacks leveled against organic, local, and fair trade. It means acknowledging the values that these approaches hold in common, while also evaluating their distinct emphases. And it requires pushing beyond individual mealtime decisions and instead asserting food as a field of public struggle. While organic, local, and fair trade each deserve individualized attention, they share some context. The starting point for all branches of the food movement is a critique of industrial farming. Today, denunciation of a mono-cropped, chemically fortified, meat-heavy, factory farmed, synthetically processed, and globalized approach to feeding the world is not hard to find. Indeed, over the past several decades this has been the subject of a thousand Diets for a Small Planet and Fast Food Nations. Many of these exposés have been very valuable. Indeed, they have had significant impact in raising public skepticism about the large corporations that dominate our food system. Yet the claims of these manifestos have not been universally accepted—in large part because of agribusiness’s dominance. There is no shortage of Farm Bureau lobbying, industry-funded research, or “free market” apologists to defend corporations against the food movement’s capture of the left plank of the American dinner table. Whether industry defenders are on the payroll of a food conglomerate or have merely internalized an awe of “green revolution” abundance, they are ever ready to extol the wonders of modern agricultural production. Their arguments hold little interest for the radical eater. There are times, however, when contrarian stances will draw from or overlap with the arguments of more disciplined detractors. Of particular note are the views of longtime food activists disgusted by the dilution of the movement’s core principles over time. Also valuable are critics grounded in a more substantive critique of the market system than that held by alternative food promoters themselves. The radical eater listens for these latter voices and seeks to separate their arguments from the muck of food industry propaganda. Of the troubling trends within the food movement, the hijacking of organic is perhaps the most well-known story. According to the Organic Trade Association, sales of organic food and beverages in the United States increased to $26.7 billion in 2010, from just $1 billion in 1990. The skyrocketing growth of the sector, combined with the fact that buyers are willing to pay a significant premium for organic food, has attracted keen and corrosive interest from agribusiness corporations. By 2006, the secret was out. A rash of articles appeared about what CNN dubbed, “The Battle for the Soul of the Organic Movement.” Kellogg, Coca-Cola, Heinz, Smucker’s, and Sara Lee had all entered the fray. Soon, Wal-Mart would move aggressively to position itself as the world’s largest seller of organic products. (Definitive numbers are not available, but it appears likely that it has succeeded.) In his influential 2006 book, The Omnivore’s Dilemma, writer Michael Pollan described the corporations’ mode of food production and distribution as “industrial organic”—a juxtaposition of terms that would have seemed an oxymoron to the movement pioneers of a few decades earlier. With the rise of industrial organic, these more revolutionary impulses have disappeared. Corporations have adopted practices that make a mockery of what people think they are buying when they pay extra for an eco-friendly label. For one, major organic brands now source from across the globe. Stonyfield yogurt uses milk from New Zealand, bananas from Ecuador, and apple products from Turkey. Costco gets organic peanuts from China, a country not known for rigorous environmental regulation. And these are not isolated examples. Since the government assumed a role in setting official rules for the use of “organic” in the 1990s, activists have waged a prolonged battle in Washington, D.C. Through what the movement-based Organic Consumers Association calls “constant vigilance and mobilization,” they have been able to hold off the worst of corporate attempts to water down standards, and they have kept some egregious inputs (most famously, irradiated sludge) from being allowed. Yet, in the fields, enforcement is spotty. Moreover, companies that are willing to downgrade their labels to “made with organic ingredients” can get away with putting manifold synthetic creations into food and still stick a green-sounding seal on their products. The local food movement—with an emphasis on supporting farmers within a limited distance of where one lives, reducing one’s carbon footprint, and eating seasonally—offers a second approach to taking on the abuses of industrial agriculture. Worldwatch magazine reported that, “in the United States alone, sales of locally grown foods, worth about $4 billion in 2002, could reach as much as $7 billion by 2011.” Although there is certainly overlap between local and organic adherents, locavores may be unconcerned with whether all their food is strictly chemical-free. And many couldn’t care less about whether producers participate in government labeling schemes. Like organic, local food has drawn numerous detractors. Some of these are not credible. Defenders of “free trade” furiously charge locavores with neglecting (in the words of the popular Freakonomics blog) the “high crop yields and low costs” of globalized markets, thus promoting inefficient land use. Of course, this position ignores all of the hidden costs of the modern food system—the subsidies and environmental contaminations—that compelled a critique of industrial agriculture in the first place. A second line of naysayers contends that, if we help local growers with our purchases, we deprive farmers in the developing world who may more desperately need our patronage. For this reason, Benito Müller of the Oxford Institute for Energy Studies argued in 2007 that the British have a “moral duty to eat African strawberries at Christmas.” This argument accepts the dubious premise that advanced industrial nations have done farmers in the global South a favor by locking them into a system of export-led agriculture. For their part, the liberal contrarians focus on attacking the concept of “food miles.” Tracking food miles is a relatively new practice. In the early 2000s, Rich Pirog and a team of researchers at Iowa State University analyzed the production of more than two dozen fruits and vegetables. They calculated that the average food item going through the industrial system travels 1,500 miles from the field to your neighborhood grocery store. Since then, this idea of trying to measure—and to minimize—the number of miles food travels on its way to your plate has become a popular conceit. It provides an easy way to talk about the nefarious complexity and CO2-spewing reach of the industrial food system. As cynics are eager to point out, however, there are some problems with the “food miles” concept. First of all, not all miles travelled are equal. Cargo ships and freight trains moving many tons of food make relatively efficient use of fuel. Therefore, even if a bulk shipment crosses a great distance, the CO2 emissions associated with moving, say, a single pound of pears from Chile might be small. In contrast, when a multitude of local farmers deliver small orders of fruit to town markets in their old, gas-guzzling pickup trucks, the emissions-per-pound are high, even if the distances travelled are limited. Second, instead of focusing only on the transportation of food to market, critics argue that we must consider CO2 emissions over the entire life cycle of a food product. One often-cited UK study concluded that its better for the English to eat tomatoes shipped in from Spain, which are grown in the sun, rather than dining on local tomatoes produced in a greenhouse, which requires heat from fossil fuels. By railing against imports, the detractors say, locavores miss the bigger picture. The point is fair, but also limited. Most local eaters are not obsessed simply with the distance their food has travelled. Rather, they promote localism as a means of encouraging an array of sustainable practices. If producers are growing for local markets in limited quantities, it is more likely they rotate between a variety of crops and are committed to more intimate stewardship over their land. Conversely, the low prices paid for food on the international market virtually require that farmers plant large monoculture acreages of a single commodity and try to profit through volume. Defenders of local food emphasize community—the notion that buying near home fosters a rich and transparent network of relationships between farmers, retailers, and consumers. It creates a sense of accountability, since consumers can verify for themselves what kind of operation is producing their food. In contrast, as one advocate says, “distance kills community.” In a globalized system, the relationships involved in food production are concealed; the methods of farming and conditions of labor are impossible to trace. This defense of local food is compelling. Yet, like organics a decade ago, the movement is in a vulnerable phase. Giant food companies are pushing into the market, with Wal-Mart having announced plans in 2008 to spend $400 million annually on produce grown locally. While “community” sounds nice, how many people actually conduct visits to local farms to fact-check advertising claims and see how their food is produced? If the industry exerts a downward pressure on standards, “local” will no longer be a reliable marker of sustainable agriculture. This danger gives the radical eater pause. The “fair trade” food movement, which emerged in the 1990s, is better established in Europe than in the United States. Nevertheless, it is gaining popularity internationally. Fair trade coffee and chocolate—the movement’s two most significant products—are widely available in stores. Other goods on the market include fair trade bananas, cotton, sugar, honey, tea, and cut flowers, sourced from more than fifty countries. The basic idea is that fair trade companies guarantee their producers—traditionally, small, worker-run farming cooperatives in the global South—a minimum price for their crops. This creates stability, allowing the farmers to cover their costs of production even if the market takes a plunge. Buyers also provide an extra “premium” to the cooperatives. This can be used for social programs or for farm improvements. In short, consumers pay a little more for their cup of coffee or chocolate bar marked with the international Fairtrade label, and workers abroad reap the benefits. The New York Times reported in November that $1.3 billion in fair trade goods were sold in the U.S. in 2010, while $5.8 billion were sold globally. Yet, as with the other food movement offshoots, not everyone believes that fair trade is fulfilling its noble aspirations. The original fair trade companies were solidarity-minded operations like the Massachusetts-based Equal Exchange, devoted to creating a more just and sustainable food system. But with the movement’s growth has come the predictable invasion of the corporate conglomerates. Obviously, even 20 percent is not a number that will impress the radical eater. Fair trade defenders respond that, whatever its limitations, the label helps spread consciousness. It is an invitation, they contend, to critically examine the unfair relationships that govern most food imports and to express solidarity with producers. But even more than local food advocates’ call to “community,” this appeal to “consciousness” rests on an optimistic assumption about how much someone’s choice at the checkout counter will translate into more substantive engagement. The radical eater views this as suspect. Such attitudes abound. Yet they represent the true weakness of organic, local, and fair trade approaches to food issues. They suggest that our most significant decisions are those we make while shopping. Those with enough money will always be able to create a market for healthy, sustainably grown food, produced under dignified working conditions. Whether the world’s majority will be ever able to be able to afford such food—whether the economy will ever be designed to produce it on a wide scale—will depend on changing many things, from the subsidy structures that hide the true cost of wanton fossil fuel use and heedless soil degradation to the power relationships that allow farmers in the global South to ship off export crops while themselves suffering from malnutrition. Such changes will involve political conflict. Fortunately, organic, local, and fair trade consumerism are not all the food movement has to offer. While not as popularly known, other strains of the movement challenge industrial food production in more systemic and more overtly political ways. The drive for “food sovereignty,” spearheaded by the international peasant movement La Via Campesina, includes demands for debt relief, women’s rights, and land reform in its approach to food justice. “Beyond organic” activists and proponents of “agroecological” farming are working to return to the holistic-minded principles that motivated the organic trailblazers of earlier decades, to revive the anti-capitalist aspects of the movement’s critique, and to restore the core notion that everything is connected to everything else. The industrial food system has proven adept at co-opting its critics when they think of themselves in its preferred terms, as consumers. The radical eater, in contrast, is first and foremost a citizen.